Sweet orange essential oil is the most important of the citrus oils commercially, and is produced in very large quantities. The fruit the essential oil is obtained from is known botanically as Citrus sinensis, and the majority of orange oil is destined for the flavour industry where it is used in juices, soft drinks, candies and pharmaceutical products. In the early 1900’s the perfumery industry used vast quantities of this oil in fragrance formulations for soaps, detergents, toiletries and perfumes. However, over the years sweet orange has been replaced in these kinds of products by synthetics, as have most other citrus oils. Surprisingly, the precise origin of Citrus sinensis has never been established, but many botanists believe it originated somewhere between South-western China and the Himalayas. 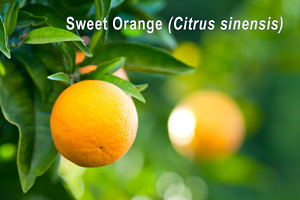 Sweet orange does not occur as a wild plant anywhere in the world, and is thought to be a natural hybrid of the pummelo (C. maxima), and mandarin (C. reticulata). For many years it was known as C. aurantium var. sinensis and considered to be a form of the bitter orange (C. aurantium amara). Belonging to the Rutaceae family, sweet orange is a small evergreen tree that reaches a height of 4 to 7 metres (13ft – 23 ft) and has a rounded crown of plentiful slender twigs, and branches that are angular when young with blunt spines. The leaves are oval shaped and dark glossy green on the upper side, and paler coloured underneath. Small white fragrant flowers are borne singly or in clusters of 2 to 6, and the fruit develops from the ovaries of the flowers. The round or slightly oval fruits are a yellow-orange colour when ripe, and the outer rind is dotted with minute glands that contain the essential oil. 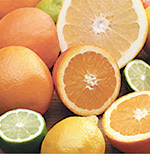 Oranges are among the oldest cultivated fruit and were mentioned in ancient Chinese literature as long ago as 2400 BC. By around 800 AD Arab traders had introduced oranges into eastern Africa and the Middle East where they were distributed via established trade routes. During the 15th century the sweet orange was introduced into the forest regions of West Africa and Europe by Portuguese travellers who brought them back from Macao, China. The fruit proved very popular and orange groves were soon established to meet demand. In 1493, Christopher Columbus set sail on his second expedition to discover the New World carrying sweeet orange seeds along with him, eventually reaching Haiti and the Caribbean. The Spanish explorer Juan Ponce de Leon is credited with introducing the fruit to Florida in 1513. By the 16th century the sweet orange had reached England. The dried peel of both bitter and sweet orange has been used in traditional Chinese medicine for thousands of years to treat anorexia, colds, coughs, digestive spasm relief and to stimulate digestion. The rind is both a carminative and a tonic, and the fresh rind is still used as a remedy for acne. The juice of the fruit is antiseptic, anti-bilious and haemostatic (stems the flow of blood). Unlike most other citrus fruits, oranges do not continue to mature after picking, therefore harvesting must be done at precisely the right time if maximum essential oil levels are to be obtained. Oranges are easily damaged, so if the fruit is destined for eating they are usually hand-picked, whereas if they are to be processed for juice or oil they may be mechanically harvested. Almost 38 million metric tons of oranges are harvested around the world each year from Brazil, California, China, Corsica, Cyprus, Egypt, Florida, India, Israel, Italy, Jamaica, Mexico, Portugal, Sicily and Spain. Although many of these countries produce sweet orange essential oil, Brazil and the USA are by far the largest exporters. Extraction of sweet orange essential oil is by cold expression of the rind, which yields an orange-yellow or orange-brown oil with a fresh, sweet and fruity aroma that is true to the fruit. The cleansing, stimulating and toning action of sweet orange essential oil makes it ideal to add to other lymphatic stimulants for treating oedema, cellulite or as part of a general detoxification program. When used in massage it is an effective remedy for poor digestion, constipation, stress, and for clearing congestion of the liver. Uplifting yet calming, the fragrance of sweet orange is popular with young children therefore it can be vaporized to dispel tantrums and frustration etc. It also disperses cooking and pet odours effectively and creates a cheering, warm and sunny atmosphere at any time of year. Sweet orange oil is a top note that blends nicely with many essential oils including cedarwood atlas & virginian, cardamon, cinnamon, clary sage, clove bud, coriander, clove, frankincense, geranium, ginger, jasmine, lavender, nutmeg, rosemary, sandalwood and all other citrus oils.